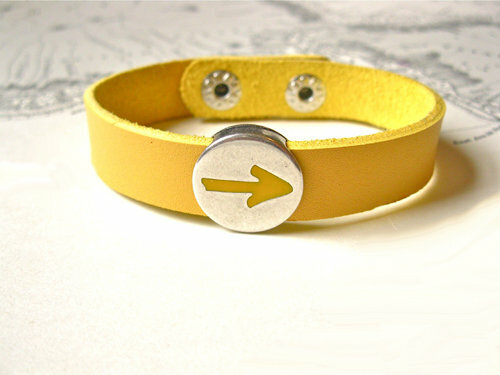 This yellow-leather bracelet, illustrates all that is important about "El Camino" - simplicity and meaning. The bracelet features the symbolic yellow arrow seen along the Way of St James - the famous pilgrimage walk / route through Spain to the great Cathedral in Santiago de Compostela, Galicia. Dimensions: The bracelet is approx 14mm wide. 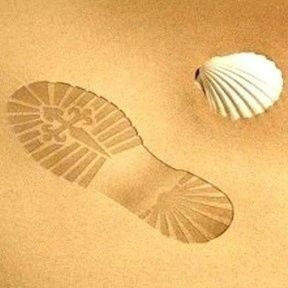 Do you want to encourage and support your friends or loved-ones as they walk their own particular camino on a daily basis? Let us send this unique leather bracelet on your behalf to show how much you care - symbolic of the pilgrim route to Santiago, but also indicative of spiritual confidence, determination and strength. The 1,000-year-old Way of St. James (El Camino de Santiago - in Spanish), criss-crosses Western Europe, arriving at Santiago de Compostela in Northern Spain on the Atlantic coast. At least 200,000 people travel to the city each year from all over the world: Some people walk, others travel by bike. Many travellers choose to do the Camino for personal, rather than any spiritual or religious reasons - taking time out from their busy, modern lives and perhaps finding inspiration along the way, whilst reflecting on their lives in a supportive environment. Show a friend or loved-one that you really care about them - and their wellbeing, and that you are thinking of them, with this meaningful charm bracelet. Comes gift-wrapped, like all our presents - and we can print a personal message on your behalf.